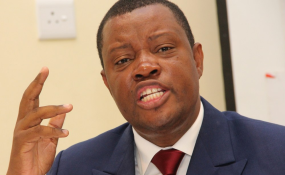 Leader of the official opposition party, Popular Democratic Movement (PDM), McHenry Venaani. Windhoek — Leader of the official opposition party, Popular Democratic Movement (PDM), McHenry Venaani, yesterday voiced concern over China's strategy to allegedly secure African debtors' natural resources. In recent years, China has shored up its presence in Africa, investing billions of dollars to build port facilities and plan maritime trade routes as part of its "One Belt, One Road" initiative to help increase its market reach. "We are hearing reports in Zambia and Sri Lanka where we are seeing that a number of countries that cannot pay China, China, as a lender, is taking over national assets of those countries, that is very key to us,". "Our partnership should be based on protecting the lender and the person that loans the money but if these loans are given for the purpose of taking over strategic assets of the nation they become very worrisome," he told Zhang Yiming before a closed-door meeting. "We view this as a very important visit and as key to us because generally all ambassadors across the world will pay us a visit but the Chinese have been the last to come and I hope they are the best to come," he said. "You know our China foreign policy is that we don't want to interfere into internal affairs of any country. So, I don't want this meeting to be seen as interference into the country's political affairs. We know this is election year," he said. "We are just here to brief you on the embassy's activities in this country," he added.